If you've broken one, then you know what a pain the search can be for a replacement yoke. Then when you find one, it is either an old, greasy salvage yard piece that may soon put you back in the same situation or an overpriced replacement piece that really isn't much better than the yoke you found in the salvage yard. Well the search stops here because Inland Empire has got you covered. Every one of their Forged ''1350'' Steel Pinion Yokes are CNC-machined for a precise fit and heat treated to deliver maximum strength and a long service life. 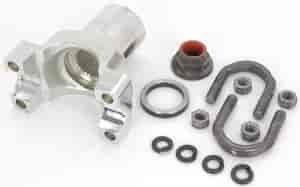 Designed for Spicer 1350 series universal joints. Includes new U-bolt style joint retainers. PY9 is rated 5.0 out of 5 by 1.